Geography books for kids are fun and they introduce kids to maps and globes, countries and regions, and to various environments and societies. They are full of beautiful illustrations and pictures and they entice kids to learn more about world geography. Children learn how to name and recognize countries and to identify them on a world map. These geography books also teach interesting facts about each country and continent. For example, children learn more about cultures and various customs in Asia or South America. Children's geography books also teach about maps and how they are designed. For example, what are longitudes and latitudes, what are the hemispheres, etc. They also teach how maps are constructed and about all the different kinds of maps. Actually this is often a subject that kids touch on at school in geography class. Therefore, these books can give them an advantage as they later attend geography class. 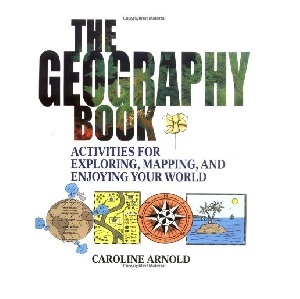 Geography books for kids often contain geography activities that are both fun and educational. For example, children have to answer questions or find interesting facts about a specific country or city. Other activities include putting stickers on a world map. For example, the Great Wall of China would go to China (children have to be able to locate China on the map). The Golden Gate sticker would be placed on San Francisco. Some children's geography books also include CDs with maps and videos. We also recommend that you buy a subscription to National Geographic so that your kid becomes interested in learning about various places around the world. We recommend two books that have received very good reviews and that are very popular among both parents and children. The first one is A Child's Introduction to the World (ages 9 and up). A best-selling book, it is beautifully written, it contains lots of beautiful illustrations and kids learn about about countries and cultures. They learn to locate countries, states, cities, continents on a world map. The book covers the entire planet, from North America to Oceania. Kids also learn about terminology used in geography such as longitude and latitude, density of population, the hemispheres, climates, etc. This knowledge will be useful as they attend geography classes. The book also contains many fun activities and a large paper globe and stickers (used for some of the geography activities). The second book that we recommend is The Geography Book: Activities for Exploring, Mapping, and Enjoying Your World (ages 8 and above). In this book, kids learn more about maps. They learn about the different types of maps and how maps can provide lots of information. They also learn a bit about geology, why there are earthquakes, how various landforms are created and all the processes that made the Earth the beautiful planet that it is today. The book contains lots of engaging activities. For example, kids learn how to map their neighborhood. The books has received excellent reviews from both parents and geography teachers, which is another reason why we highly recommend this book.